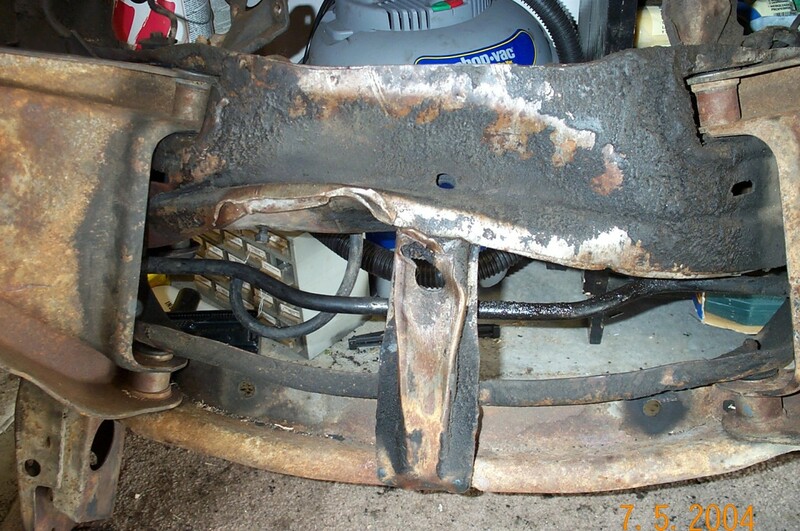 When I bought the car I knew it had some damage to the subframe, but I thought the damage was minimal. After a lot of work removing the subframe from under the car, I was able to determine the damage was much worse than expected. 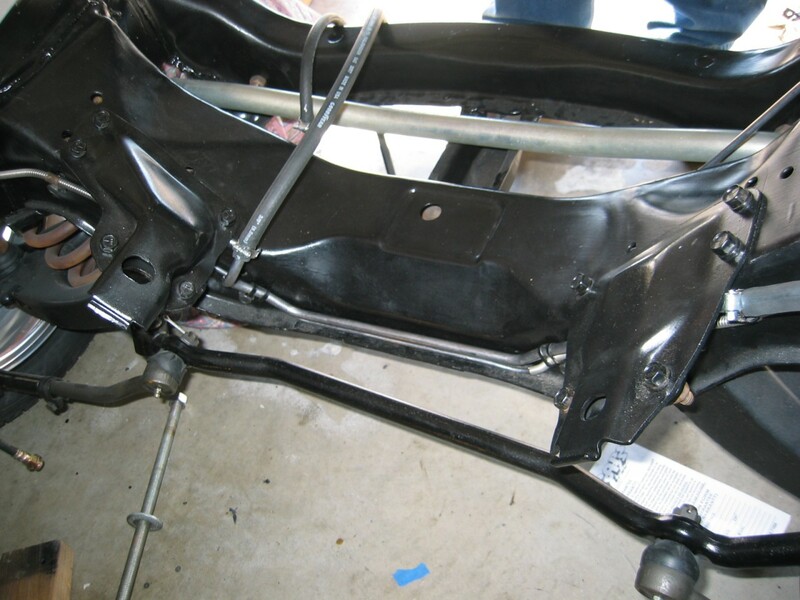 This picture shows the bottom of the subframe. Whatever it was that someone ran over barely missed the front crossmember on the subframe, but completely destroyed the center connecting piece and the rear crossmember. It pushed the front-left face of the rear crossmember back 2 inches and completely buckled the bottom of the crossmember. I found a donor subframe from a '69 Firebird sitting in a field in East Texas. I had to weld on plates to fix the common rust problems with the mounting holes. 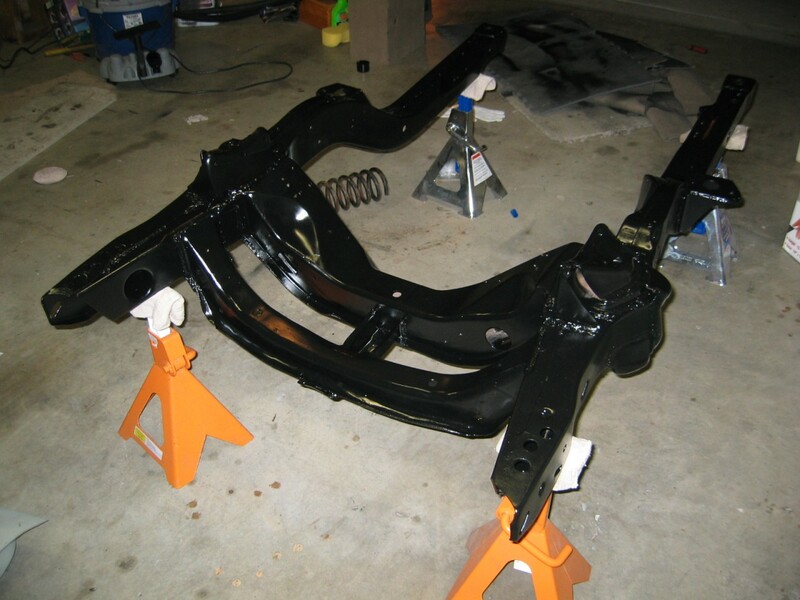 After sandblasting, I painted the subframe with Eastwood Rust Encapsulator, followed by Eastwood Chassis Black spray paint. This picture shows the final result. 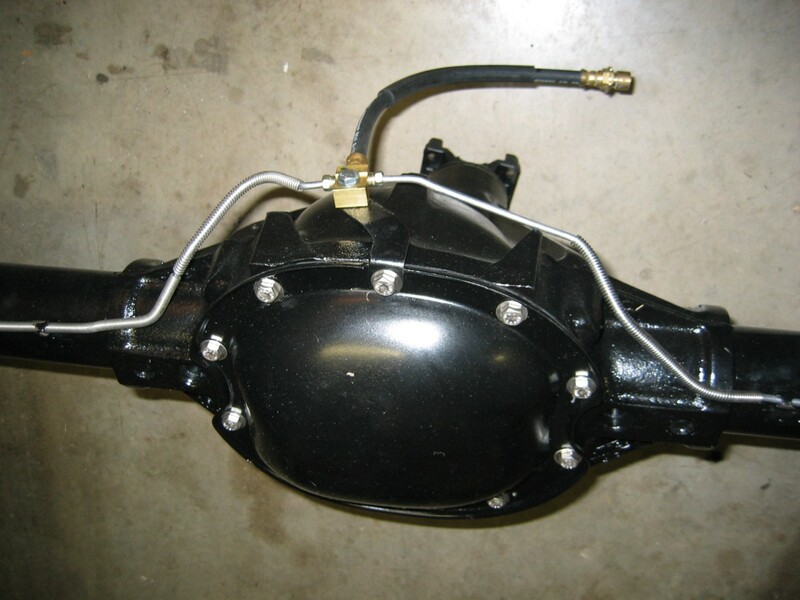 The original car had front and rear power drum brakes. I decided to convert the front brakes from drum to disc for better stopping power. I purchased the complete Stainless Steel Brakes kit from Classic Industries. The kit came with everything necessary for the conversion. Here, my father and I are working on installing the new SSBC brake kit. I opted not to use the original distribution block with the supplied adjustable rear proportioning valve from the SSBC kit. Instead, I purchased a new AC-Delco disc/drum proptioning valve made for a second generation Firebird. I had to modify the original distribution block mounting bracket, and custom made two brake lines from the master cylinder to the proportioning valve. I ordered all new brake lines from Classic Industries. The installation of the new brake lines on the body of the car was fairly easy. The two front brakes lines fir perfectly into the new proportioning valve without any modification. The rear brake line to the back of the proportioning was a tight fit against the back of the booster because it required that I add a reducer fitting. 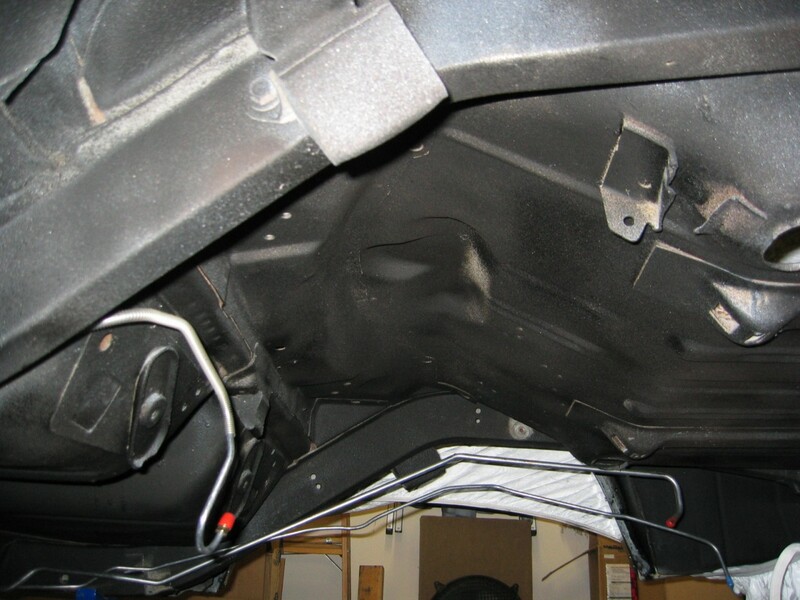 This shows where the new front-to-rear brake lines goes down the driver's side frame rail right under the back seat. Here is where the new front-to-back brake line ends near the rear axle. 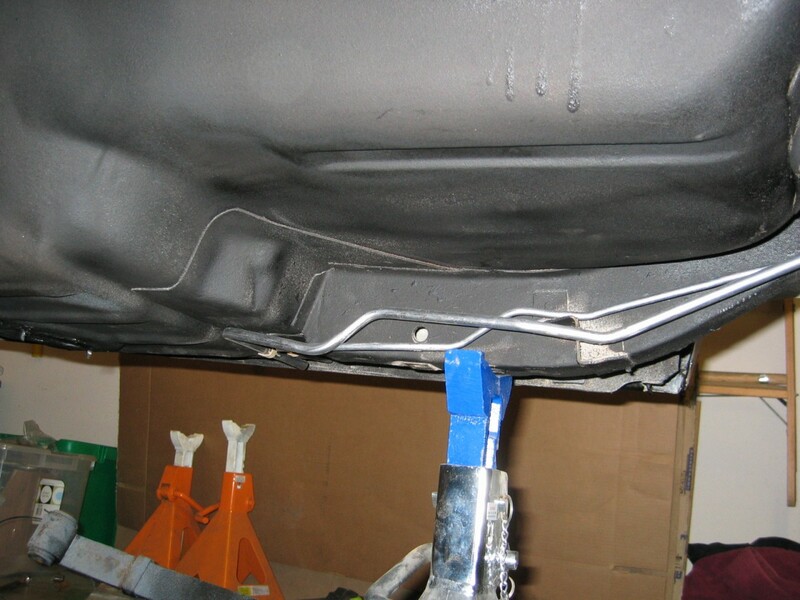 You can also see the new fuel lines being installed on the passenger frame rail. I replaced both of the hard lines on the rear axle. I also replaced the rubber flex line with the brass splitter that connects the hard from the body to the two hard lines on the axle. Funny thing was, when I took the orignial part to a local shop I found out the replacement '69 part was wrong. I came to find out that I actually had the '70 rear flex line installed on my '69 Bird. 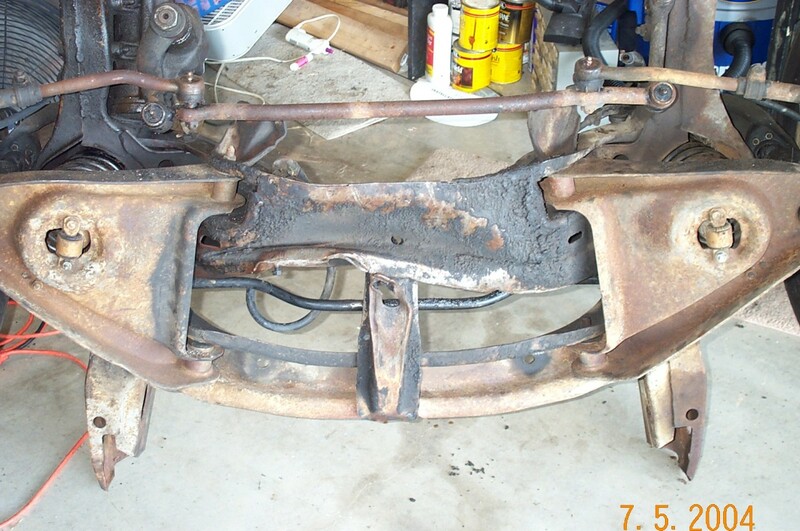 Here is the original rear end that I pulled out from under the car to clean and paint. I cleaned it using Easy-Off oven cleaner, spray degreaser, wire brushes, and lot of elbow grease. It was DIRTY! I think someone even sprayed undercoating on the rear axle at one point. After cleaning the rear axle, I opened up the differential and drained the old fluid. After installing a new gasket, I filled the differential with fresh fluid. 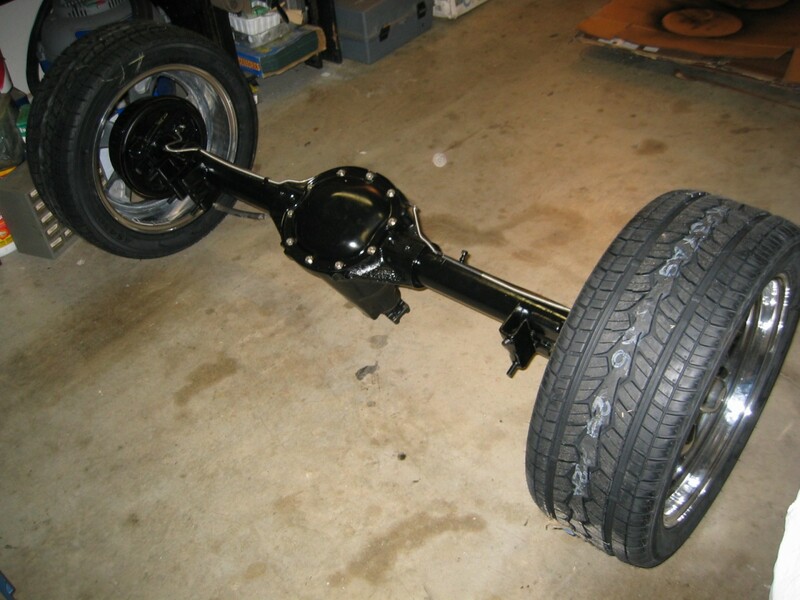 Finally, I painted the rear axle with Eastwood Rust Encapsulator, followed by Eastwood Chassis Black spray paint. I put on new stainless steel bolts for the differential cover. 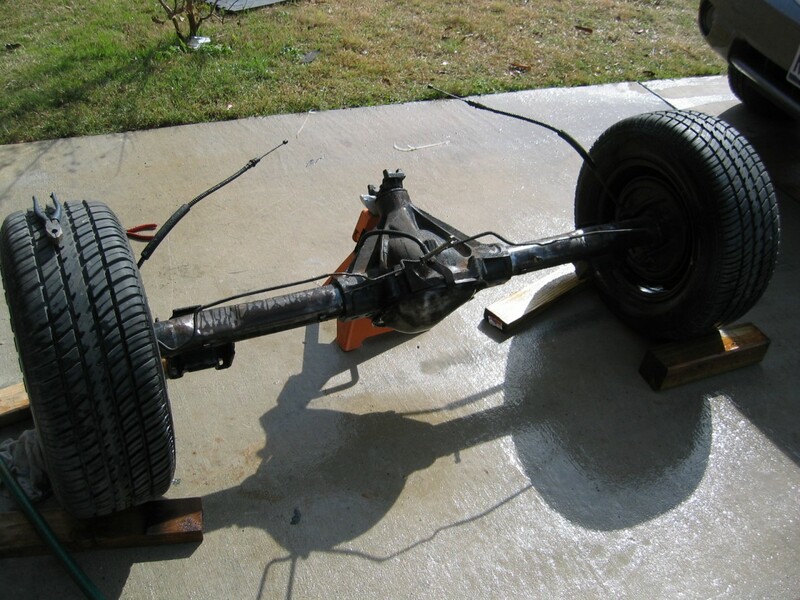 Another picture of the completed rear axle before it was attached to the rear springs and placed back under the car. 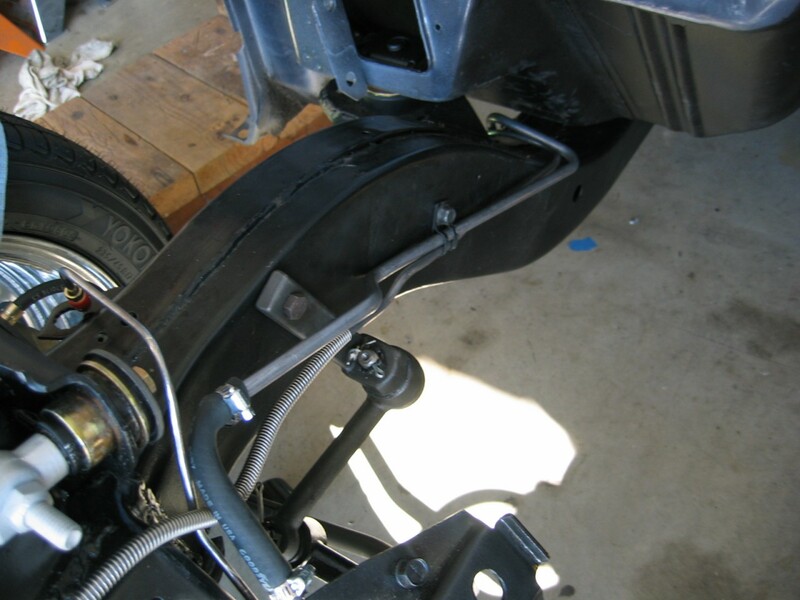 This final picture shows the rear axle back in place under the car with the new leaf springs. I decided to leave the 2.78 non-posi gears in it for now. Since this car is mainly for cruising, I decided to keep the higher gears to maximize fuel economy for road driving. If I decide I don't like the performance the way it is, I can always change out the gears later. Of course you have to rebuild the front suspension, and mine was no exception. But instead of replacing with standard rubber bushings, I decided to stifen the ride a bit. I purchased the Polygraphite Super Front End Kit from Performance Suspension Td	echnology (PST). It came with all new polygraphite bushings, ball joints, inner tie rods, and a new idle arm. Since we didn't have the weight of the car and the engine to help us compress the new coil springs, we had to resort to other measures. 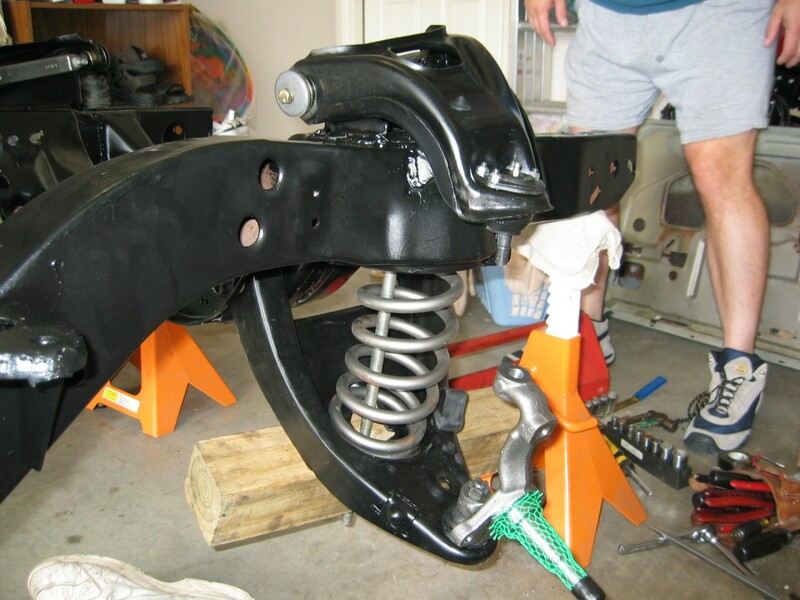 We tried to use spring compressors, but they wouldn't fit through the hole in the lower control arm. We ended up using a 4x4, a 2' long piece of 5/8" all-thread bolt, and some heavy duty nuts and washers. I also installed a new 1 1/8" front sway bar from Performance Suspension Technology (PST). Let me tell you, this was a BEAR to install. I couldn't get it to fit. 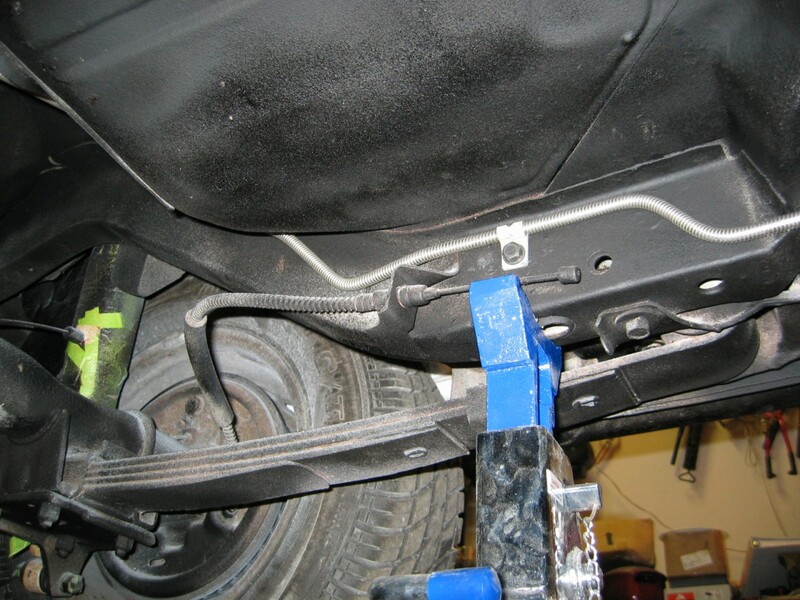 Finally, my friend Kevin showed me that one person needed to use a large pry bar to hold the sway bar in place against the frame while the second person installed the mounting brackets. Thanks Kevin!! One Saturday in early Feb 2005, I had over a few members from the South Central Texas Pontiac Club. We had a mini "Tech Day" in my garage running the new fuel and brake lines, and then dropping in the rebuilt engine. Bending over the frame is Alfred Flores, our club President. Behind him is Raymond Clay, one of our club Vice-Presidents. 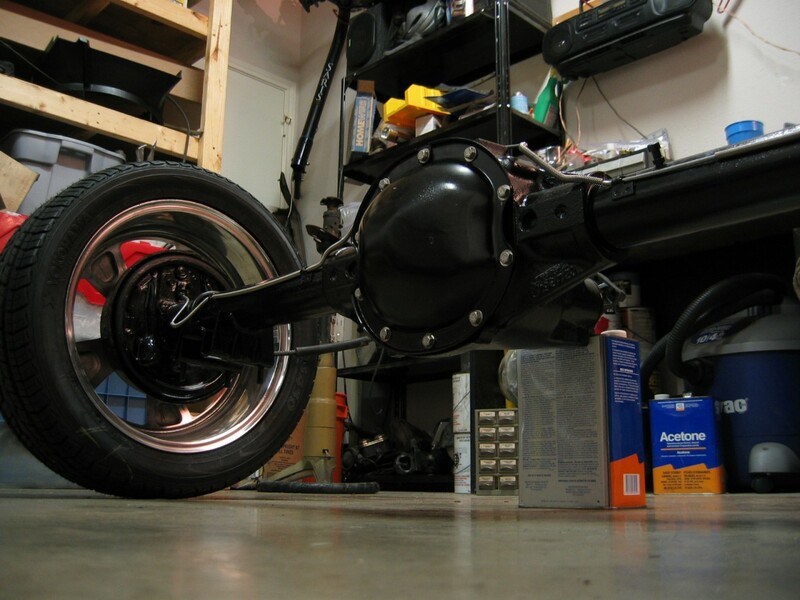 Just behind the mechanical fuel pump on the engine, the fuel lines run along the subframe rear crossmember. The fuel line runs on the back of the rear crossmember and passes through the two V8 engine mounting frames and is attached in two locations. The vapor line runs on the front of the rear crossmember. 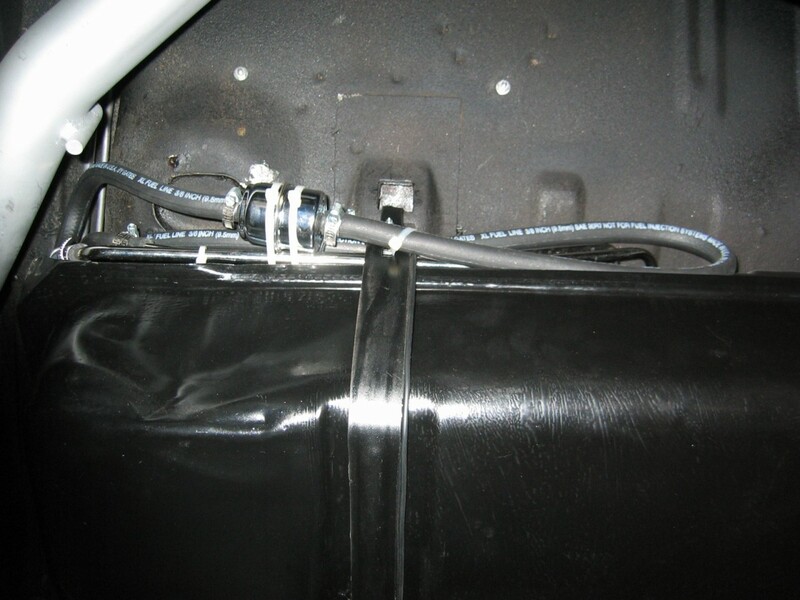 Now, the new fuel lines manuver around the bend at the rear crossmember of the subframe and start to head to the back of the car. 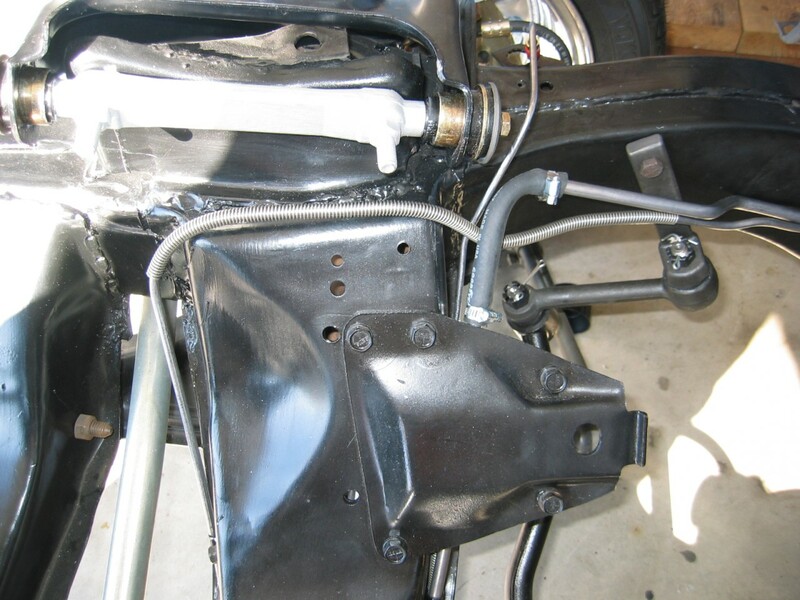 Then, the lines cross over the subframe just behind the front subframe-to-body mounting bolt. 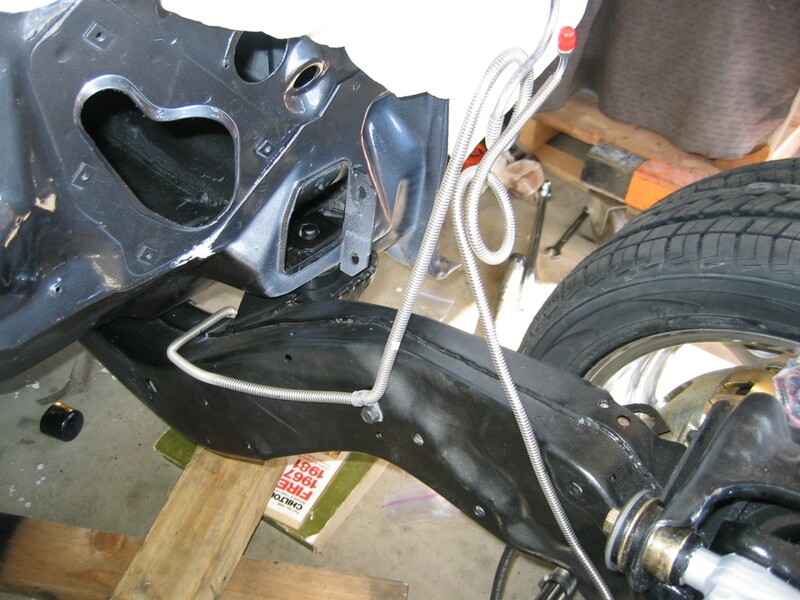 Next, the fuel lines run straight along the outer passenger side of the subframe. 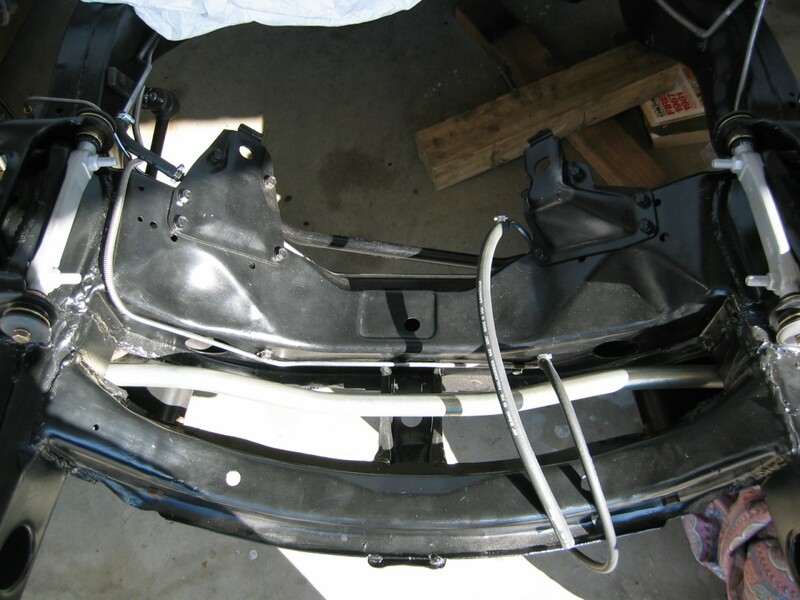 Finally, the lines run down the floorpans and cross to the inside of the rear frame rails. They travel along the length of the frame rail and end up right next to the gas tank. 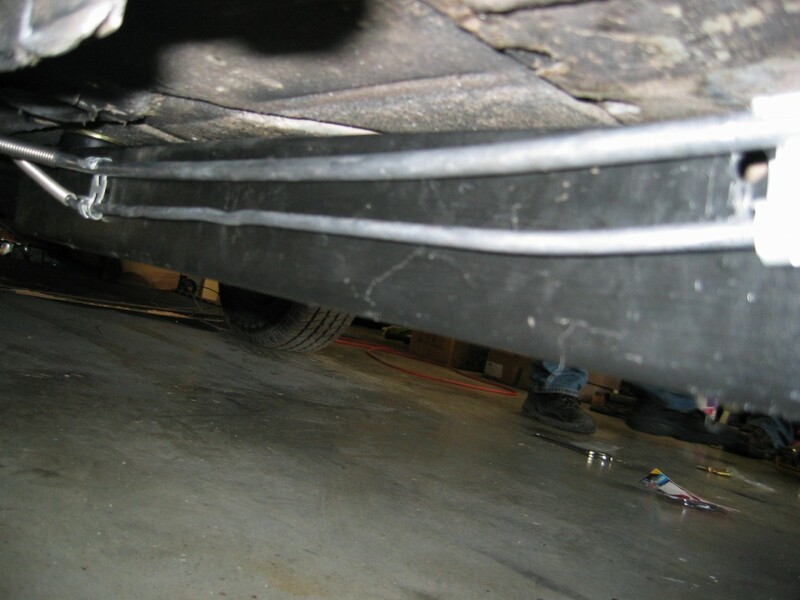 Here they are connected to the fuel tank sending unit with standard rubber fuel line. Right in front of the gas tank I installed a 3/8" in-line fuel filter. 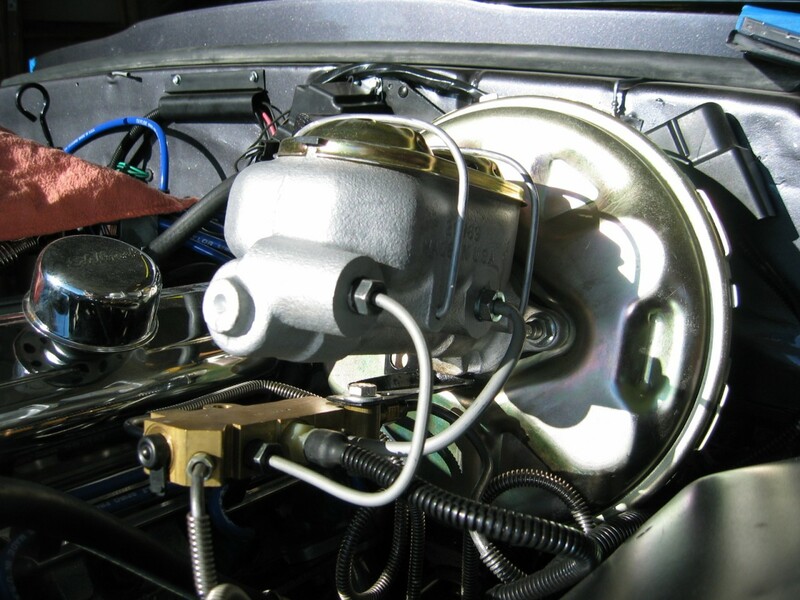 I originally had a fuel filter installed just before the fuel pump, right next to the engine. I decided that it would be too difficult to change the fuel filter when it was mounted way up under the engine, so I moved it near the fuel tank in the back to be more accessible. I had a bunch of parts for my car zinc plated at a local shop. Here are all the plated pieces the day I get them back from the shop. Overall I was very pleased with the results. 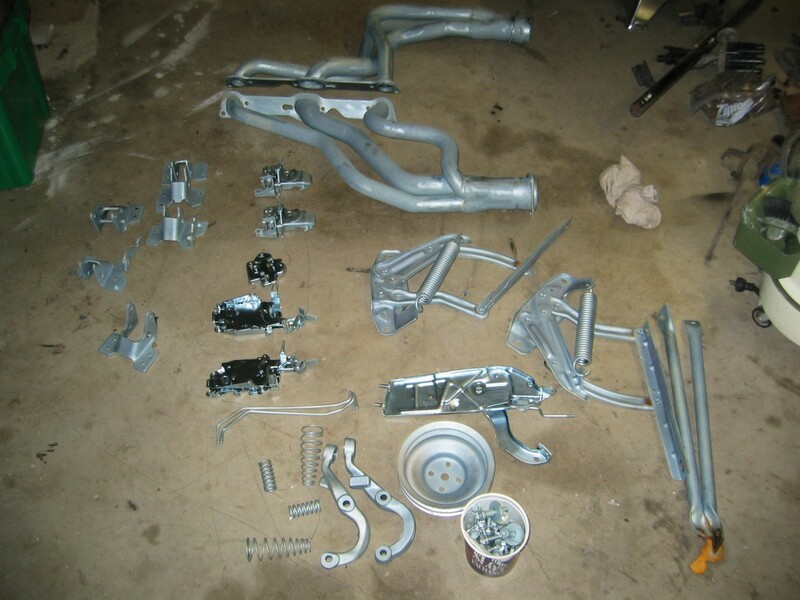 I think it cost me just over $100 to get everything shown here plated, including the headers. The door lock assemblies turned out beautifully. It's sad that noone will ever see them on my finished car.